As usual, Pugin displays exactly how the roof is supported. In this case, it is with a series of stout wooden beams, joined in scissor-bracing at the top. Most of the original lime plaster between the beams has now been replaced with plasterboard on the south roof, but the north roof has still mainly the original 1843 lime plaster. These were originally made in the mid-1850s for St George’s Cathedral. They were installed here in February 1895. The parish magazine of December 1935 and January 1936 reports “The Stations of the Cross are being cleaned and revived. Cost £8 8s. The restoration has discovered some of the Stations were painted in 1854, others probably at a later date. Some are on canvas, some on thick wood, some on thin. Possibly the artist first commissioned died before he had completed and then others took his place; the colouring of the clothes and expression of the figure differ according to the artist”. The Stations were heavily restored after the 2002 fire in the church. The windows on both sides had to be quite short to fit within the slope of the aisle roofs. Taller windows would have added greatly to the cost of the building, needing the aisles to have their own pitched roofs. 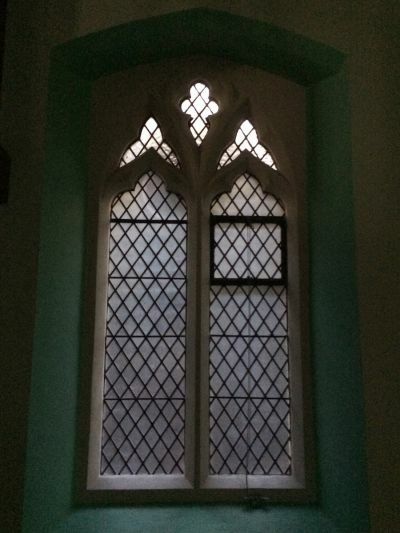 Although the windows are economical in size, the upper lights are all different in shape, individually designed by Pugin. He abhorred the symmetry of neo-Classical buildings and enjoyed diversity. This stone covers the vault in which three members of the Fogarty family are buried. 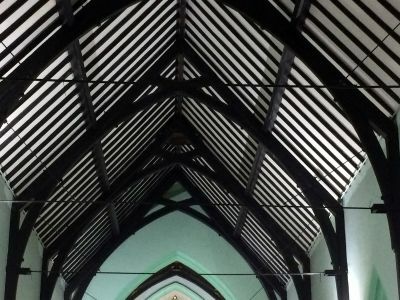 They are the only people given the privilege of interment within the church, because of their bequest which paid for the construction of the Lady Chapel in 1850. John Fogarty senior ran a pub in Brookhill Road. 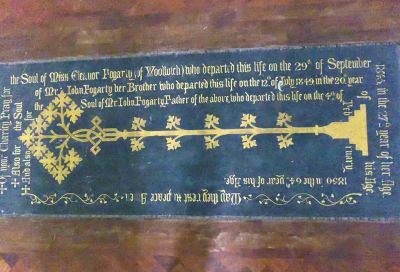 John Fogarty junior was training to become a priest when he died, aged only 19. The original choir loft was extended forward in 1982 to provide additional seating for the congregation. The organ was originally made around 1800 by the brothers James and David Davis of London. They made it for St George’s Chapel in London Road, Southwark, the predecessor of the church which is now St George’s Cathedral. When the chapel was superseded, its organ was transferred to Woolwich in 1849. The Kentish Independent reported in 1860 that the organ had been rebuilt. Parish magazines refer to cleaning and repairs in 1905. Canon Monk recorded in 1935 that “The Organ, on its last legs, has been reconstructed (it is really a new organ with some of the old parts) and become a very fine instrument”.